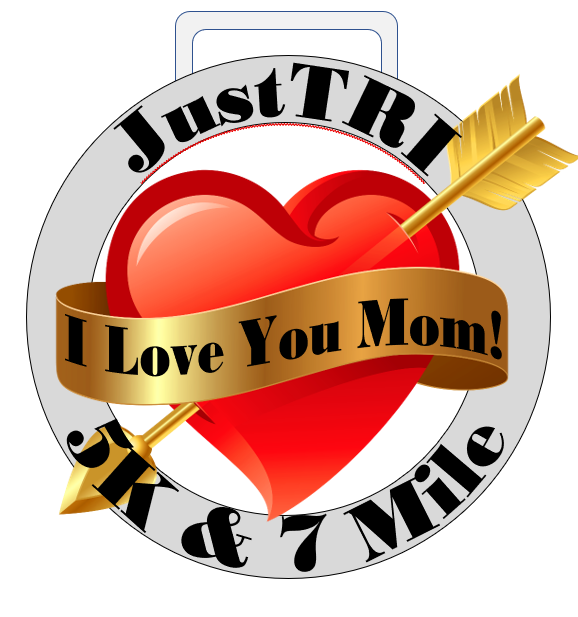 JustTRI-7 Mile Fun Run AKA "2019 Dragon Series" & The "I Love You Mom" 5K Run or Walk, 2 Medal Run! The “I Love You Mom” 5K and the JustTRI-7 mile “Dragon” is the first running event of a three-part series throughout the summer. Athletes who complete all three events will earn the complete trifecta set of medals. The I Love You Mom 5K and the JustTRI-7 Mile Dragon is being held on May 12th in Steilacoom at Topside Bar and Grill. The 5K is an enjoyable, but a challenging fun run or walk. Both events are stroller and pet friendly. The 5K route is 100% on pavement and very well marked. For the 7-mile participants this is a 2-loop, 2-medal run. You get the coveted 5k "I Love You Mom" medal and the first part of the “Dragon Series” medals. The Dragon Series was created in 2018, continues this year as the Dragon 3D—3 running events—and is being planned for 2020 and beyond. It’s just for fun! Our 2019 venue is perfect at Topside. It is a great place for a fun breakfast or dinner, they have great views and a wonderful staff. Dress warmly and grab a cup of coffee and breakfast after the race. The race may be just short of 7 miles and maybe long of 5K...but it's a Dragon and that’s how we roll! We will keep in touch with emails, please look for them. Stay up to date by visiting our Face Book page and the RunLakewood.com website for all the important race updates! JustTRI Athletic Events hosts multiple events throughout the race season, the Dragon Series kicks off the summer, followed by the JustTRI Black Hills Triathlon and Dragon #2 on June 16th in Lacey. We then conclude the season with our Half Marathon and Dragon #3 at Fort Steilacoom Park on September 15th. We keep all our events fun, provide all participants with a medal, a shirt, and an overall winning experience! After all, when you join a race why not win every time! Why ask why—JustTRI! JustTRI provides race leadership for the SummerFEST Sprint Triathlon on July 13th. The SummerFEST Triathlon is part of the Triple Threat Triathlon Series, which includes both the Black Hills Triathlon and the Bonney Lake Triathlon. All combined these Triathlons are the best in the PNW! Packet Pick up...Please show up a little early on race morning so we can get you set up with your Bib number, shirt and any swaggy waggy we can drum up! Packet Pick up: Starts 1 hour before the race at Topside!